A few weeks a go I participated in a panel organized by the European Journalism Centre at Picnic called From Database Cities to Urban Stories. Our cities are increasingly becoming data-rich environments. The ecology of apps, visualizations and location-based or context-aware media and information systems generated around urban data environments, have the potential to radically transform the way we understand, inhabit and build our cities. In addressing this theme, the EJC posed a crucial question, that is also one of our main research questions: ‘How do we design infrastructures that help support active citizen engagement?’ Or in other words: how do we engage new media technologies in urban design in such a way that they make our cities more social rather than just more hi-tech? I was particularly impressed by the way Eymund Diegel of the Public Laboratory for Open Technology and Science addressed this question during his talk. The Public Laboratory is an initiative that is inspired by the citizen science movement, and they develop open-source tools and practices that allow communities to ‘identify, redress, remediate, and create awareness and accountability around environmental concerns.What is further important is that these tools are inexpensive and accessible, and have a high hands-on “Do-It-Yourself”-ethics. One of these accesible technologies Diegel showed us was a methodology for balloon and kite mapping. 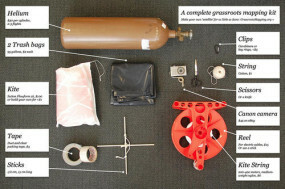 It’s a very basic approach: connect a cheap digital camera to a kite or a balloon and you are able to do your own aerial photography. Why you want to do that? Google maps is great if you live in the US or Europe, Diegel explained. But in countries like Peru there are no street-level maps. And besides, these Google maps do not allow you to collect information on issues that you yourself find important. For instance, the balloon and kite mapping technology was used to map oil spills on the Us Gulf Coast, and in Lima Peru to to measure the health of vegetated areas. The data thus assembled can be used in two ways. First, it gives activists access to data they have assembled themselves, so they no longer have to rely on the willingness of governments to publish data. Especially when they want to put pressure on other parties to act (improve the climate of the vegetated areas, stop or clean up oil spils) it is important to have such data to support their demands. Second, the pictures (which can be beautiful and even poetic) can also be used as tools to engage a wider audience, to convince people in a neighborhood that the issue at stake is also theirs, in other ways to forge a sense of ‘ownership’ of the issue in a wider community. 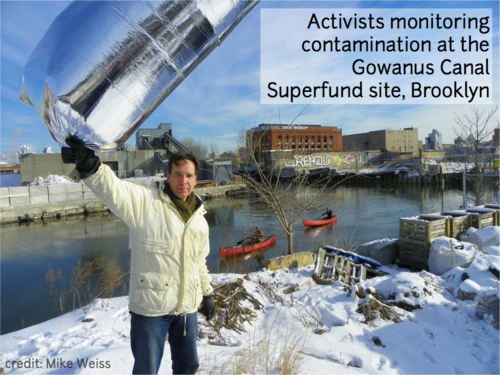 Diegel himself used the kite mapping technology in a conservation project set up for the Gowanus Canal in Brooklyn. 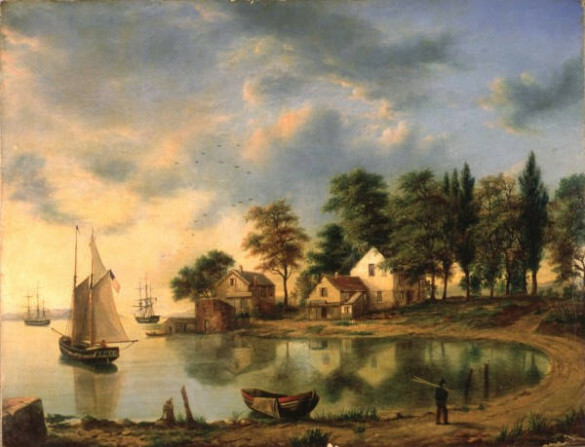 The Canal is an old system of tidal creeks in Brooklyn that during the industrial revolution grew into a maritime and commercial shipping hub. By the beginning of the 21st Century, the canal had grown into a heavily polluted and almost lifeless pool of water. Several community organizations have engaged themselves with the canal, and the kite and balloon photography has helped them in the clean-up and restoration of the Canal, as well as bringing about a wider awareness of the enviromental problems. For instance, the kite photography was used to detect illegal oil spills. The photo’s were also be used in an attempt to trace the historical paths of the creeks – parts of which had been turned into landfills. By overlapping balloon-photo’s of the area with historic maps, hints were found as to where the original sources of the creek could be found. On the very same places where they were found on the original map, on the balloon made maps weeds showed up that had started to grow between cracks in the concrete that is now covering parts of the area: a possible proof that underneath the concrete there might still be a water source. Finally the photo’s themselves have become poetic statements that can be used in awareness campaigns. They have for instance photographed the canal in various seasons, and some of the pictures are quite beautiful. What I found interesting about Diegels presentation was that he showed how a cheap mapping technology such as kite photography can be used to gather information, not as an end in itself, but as a starting point for further action and wider engagement. For instance, in Brooklyn Diegel works together with the Gowanus Dredgers Canoe Club. When they were hypothesizing about the sources of the creek – with the help of the balloon map – they went out with their canoes to take samples of the water close by. The canoe club is also part of a broader awareness campaign, in which they take high school students on trips to show them ‘the dirtiest canal in New York’. And perhaps that is the most important lesson: in projects like this, it is not so much about the technological design, but also about the much wider social design: how do you build communities around the technologies, and enable a network of various groups to participate.